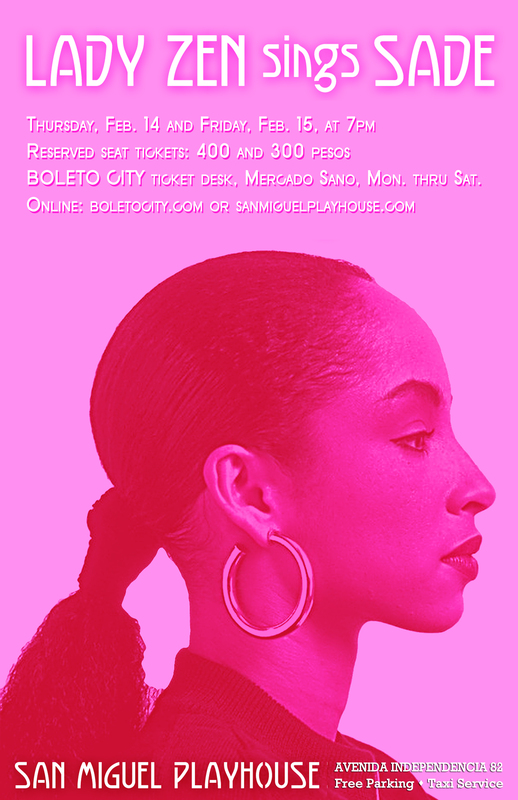 LADY ZEN SINGS SADE AT THE SAN MIGUEL PLAYHOUSE, two performances only: Thursday, February 14 (Valentine’s Day) at 7pm; and Friday, February 15, at 7pm. The multiplatinum artist Sade was born in Nigeria as Helen Folasade Abu, and brought up in England as a British citizen. Her 1984 album Diamond Life was an international hit, the best-selling debut album of all time by a British female vocalist. Her song “Smooth Operator” is one of those iconic hit singles from the Eighties, instantly evoking the decade, yet remaining fresh. Some of her other songs, “The Sweetest Taboo,” “Is It A Crime,” and “Tar Baby,” were so popular that Top 40 radio played the tracks even though they were never actually released as singles. Sade (pronounced shah DAY) has had a considerable influence on other singers, and yet her vocal style is difficult to classify. The husky quality of her contralto voice has evoked comparisons to Billie Holiday. Lady Zen Sings Sade will be presented with a top-flight backing band. For those who do not wish to purchase online, tickets may be purchased Mondays through Saturdays, between 11am and 5pm, at Boleto City, the ticket desk on the second floor of the Mercado Sano, Ancha de San Antonio 123, for 400 pesos (center section) or 300 pesos (side sections). The phone number of Boleto City is 152 6432.